The economy at your fingertips. India’s internet economy is flourishing—but for how long? 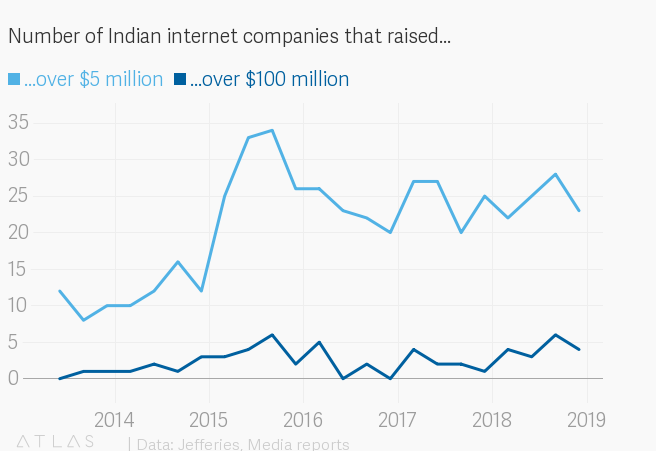 2018 was so good for India’s young internet firms that just 13 such ventures together raised over $100 million (Rs693 crore). But this joyride might be shortlived. On Dec. 26, the Narendra Modi government abruptly announced several restrictive changes in its foreign direct investment policy for online retailers. Under the new rules, online marketplaces have been barred from entering into exclusive deals for selling products on their platforms. The government has also said that no more than a quarter of the inventory on an e-commerce platform can be from a single vendor. Tweaks to India’s e-commerce policy could wreak havoc, global research firm Jefferies India said in a note. “This could significantly disrupt the business model of leading players if implemented and will at least be an overhang in the near term till more clarity emerges,” the analyst note said. Last year, private internet firms raised a cumulative $8.4 billion versus $7.5 billion the year prior, according to Jefferies. “Fund-raising has been broad-based with 13 companies raising over $100 million across segments such as e-tailing (BigBasket, Flipkart, Udaan), online delivery (Swiggy, Zomato), fintech (Paytm, Policybazaar), services (Byjus, Gaana, CureFit), travel (OYO), gaming (Dream11) and social networking (Sharechat),” Arya Sen and Ranjeet Jaiswal, analysts at Jefferies India, wrote in the note. Much of the funding activity was fueled by foreign players. “Softbank, Walmart, and Chinese companies such as Alibaba, Tencent, and Meituan Dianping have been some of the key investors,” the note said. Walmart made the biggest splash with the Flipkart deal. To name a few others, Swiggy saw a $210 million funding round being helmed by Chinese food-to-flights startup Meituan Dianping in June and a whopping $1 billion led by South Africa’s Naspers in December. Even as 2019 looks hard amid the new government policies, there is a glimmer of hope. Jefferies expects “a reasonably strong quarter” from Info Edge, the holding company of online recruitment portal Naukri.com, matrimony site JeevanSathi.com, real estate classifieds 99Acres.com, and education classifieds Shiksha.com. Local search engine Just Dial is also “expected to deliver another steady performance” going forward, it said. Online travel agencies (OTAs) remained steadfast in the December quarter—a peak time for holidays and travel–despite air traffic growth slowing and controversies brewing with hotels. Domestic air traffic hit a 51-month low in November, likely due to a slow rise in fuel consumption and capacity constraints at metro airports. In December, hotel aggregators like MakeMyTrip, goIbibo, and OYO faced backlash and boycotts from partner hotels that accused the platforms of engaging in deep discounting and erratic policy changes that hurt business.